At the time of my writing this my dishwasher is sloshing in the kitchen and the sky is grey, overcast, the birds making a hurrah outside, rousing their sleepy lovers to pack quickly for the oncoming journey South. Shoes lounge under my sofa and alongside the furnace. Scarves and silk kimonos flutter gently -- hung across chairs -- as the ceiling fan whirrs. The tables in my living room are piled high with kraft truffle boxes, tape-wrapped packages of lavender, baskets full of sparkly bracelets and capelets, and vases stuffed with heart-topped skewers. There's a big pan of freshly ground chocolate in the kitchen. There's a half empty bag of raw cacao beans slumped over on the counter, alongside the pan. 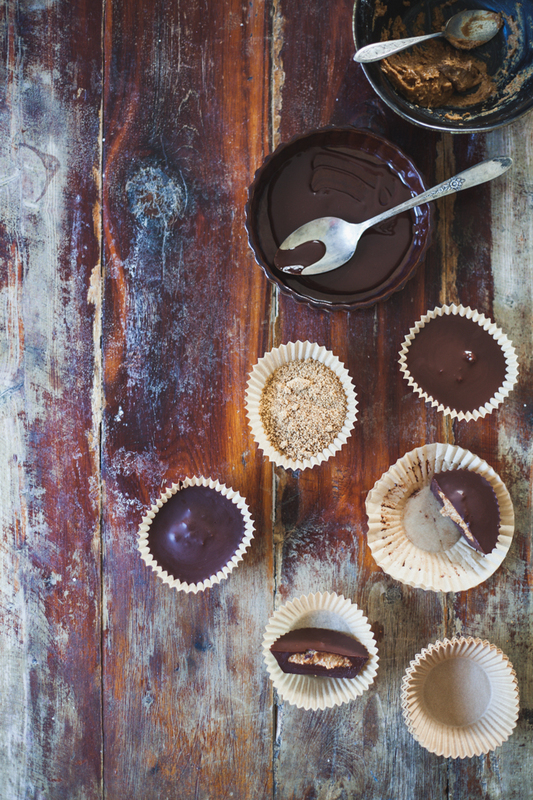 And a forgotten bowl of almond butter cup filling reflects some of that silver morning light on its oily surface. The wedding is coming up, and fast. It's barely a week away now. I feel pretty good about everything, at this moment. There are things that need to be done, but nothing so stressful that it makes sense to worry. Mostly it's fun things, like trying out a bunch of cheap bottles of wine from Trader Joe's so that we know what to buy for the wedding. Or making truffles. Finalizing the seasonal flowers we're getting. Or getting little thank you gifts for my mum, maid of honor, and amazing wedding coordinator slash very giving friend. It helps that Logan and I dove into this chocolate project so close to the wedding. Chocolate making seems to be both therapeutic and stimulating. We're both calm and psyched. My brain must be creating positive chemicals in anticipation of that chocolate fix of Caffeine, Theobromine and Anandamides (both bliss chemicals) that dilate the blood vessels, increase the heart rate, and release natural opiates in the brain. Eating chocolate creates a sense of being in love, in that way. Minus the butterflies in the stomach. I feel really fantastic that we get to share our chocolate with our wedding guests. Both because Logan and I are making the truffles with love, by hand. And because chocolate is a magic love potion that we know will get everyone into that love-drunk-state-of-mind. Let's all be blissed out for the evening, eh? I've recently become fond of Venezuelan chocolate in particular. The cacao stock we've been using has turned into a really lovely liquor, with notes of red fruit and toasted nuts. It has a nice, medium intensity the way we make it -- which, I think, makes it a nice pair for nuts and fruit and brown sugar. 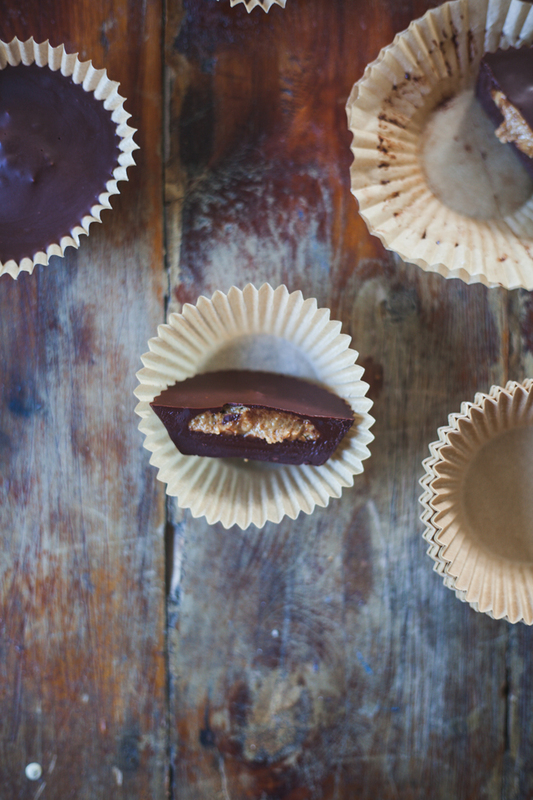 We sweeten our chocolate with Organic cane sugar, but in these almond butter cups I chose to sweeten the filling with coconut sugar. Partially because it makes these candies low-glycemic (which means I can eat loads more of it). And partially because I like the brown sugar flavor natural to coconut sugar. I've been using Big Tree Farms brand, which I think has a cleaner flavor than some other brands -- less treacle & grass (only a quality of poor coconut sugar products), more sassy brown sugar. Place a bain marie, double boiler, or a glass bowl over a pan of water over medium-high heat. Once hot, add your chocolate and remove from heat. I like to add the chopped chocolate and let it sit in the heat for five minutes before stirring it. Stir occasionally until the chocolate has melted completely. 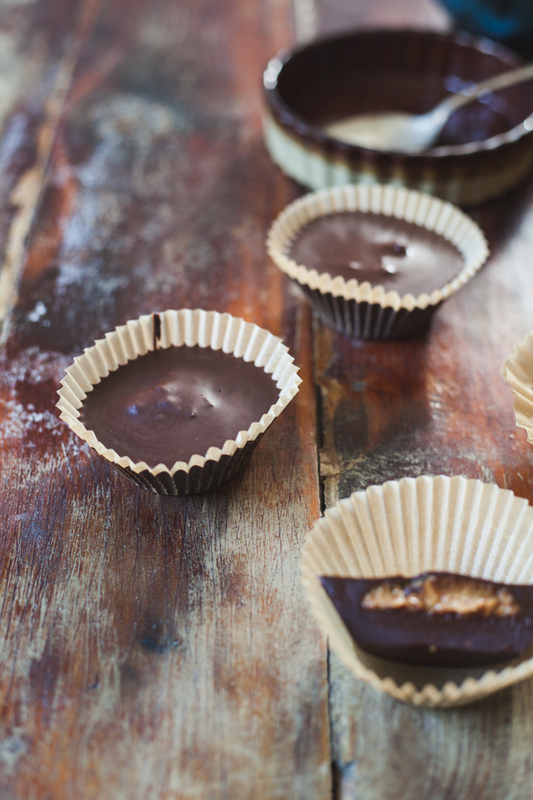 Once the chocolate is liquid, add ghee (or coconut oil). Stir until combined. 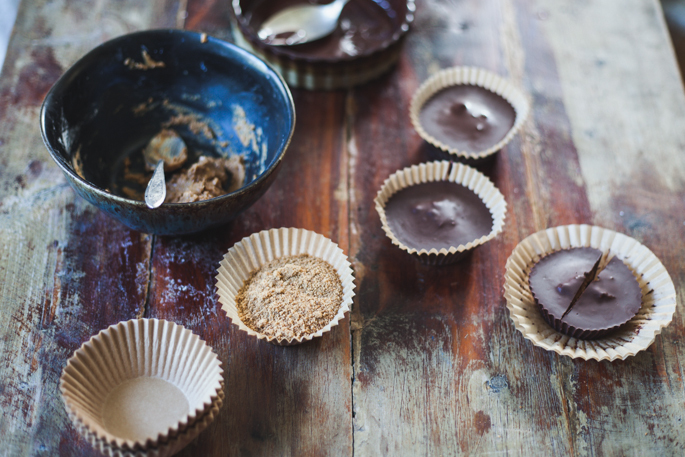 In a small bowl, combine the almond butter, coconut sugar, arrowroot powder, and salt. Set aside. 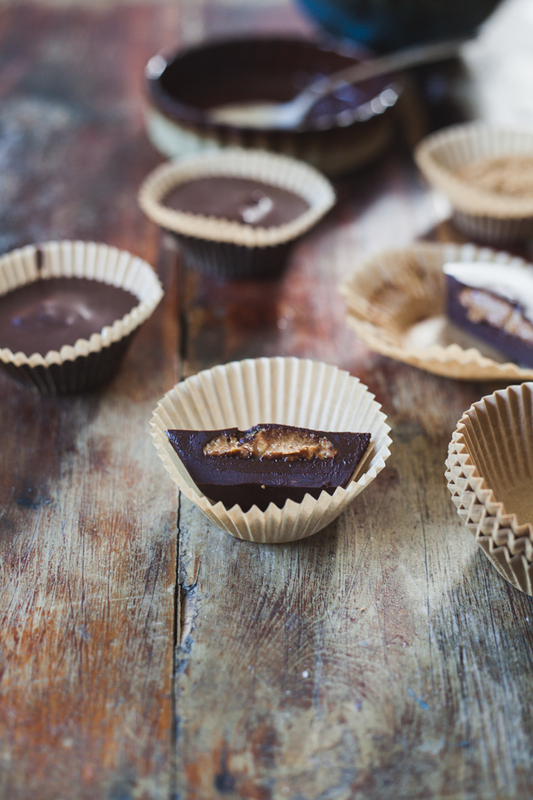 Pour the rest of your chocolate over top of the almond butter filling, filling the cups with chocolate until the filling is completely covered. My cups ended up being 2 & ¾ inches thick, in total.